The list of spring flowering trees continues . . .
Magnolia acuminata , cucumbertree magnolia hybrids, Zones 4-8. 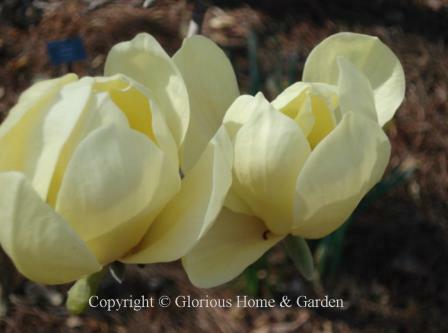 Crosses between Magnolia acuminata and other species have produced beautiful yellow deciduous magnolias that are a delight to have in the spring garden in shades of soft cream to canary (though heat may tend to fade the intensity of the color.) 'Butterflies' (shown below), 'Elizabeth,' 'Limelight,' and 'Yellow Fever' are some of the cultivars. creamy-white, sweetly-scented flowers bloom mainly in May and June and then sporadically throughout the summer, even into fall. Each large blossom lasts only a day or two before fading, but new ones succeed them soon after. Large cones develop with red seeds that ripen in the fall and are also very ornamental. This iconic native of the South has many uses--as a superlative specimen, thick hedge or privacy screen. Give these large flowering trees plenty of room to develop their full potential --to me they look much better with branches brushing the ground than limbed up (sort of clothed rather than naked). There are many beautiful cultivars on the market. 'Bracken's Brown Beauty' is dense and one of the most cold hardy, 'D. D. Blanchard' has large deep green leaves with orange-ish felted reverse, 'Little Gem' is more compact and blooms young, 'Timeless Beauty' is also a smaller size reaching about 20' at maturity. I noticed that Monrovia has a new compact one called 'Baby Grand' (great name!) that at 8-10' sounds perfect for a smaller garden. Magnolia insignis (also known as Manglietia insignis), red lotus tree, Zones 7-11. 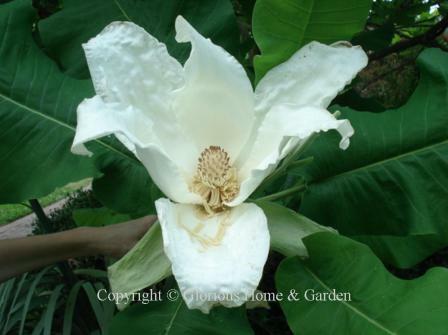 This member of the magnolia family is native to S. China, Nepal, and Burma. It is semi-evergreen to evergreen and can reach about 25’ to 30’ in height. 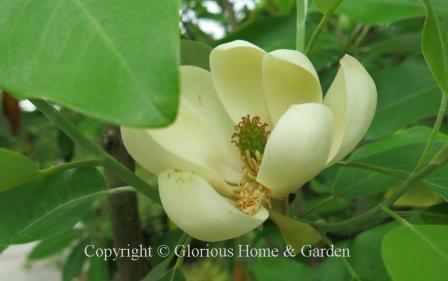 The fragrant flowers are a lovely combination of cream and light to deep rose-red quite unlike our native magnolias. The hardiness is open to debate but this one is doing quite well at the Smith-Gilbert Gardens in Kennesaw, Georgia, Zone 7. It is recommended that the tree be planted in a location sheltered from cold winter winds. A beautiful tree with a tropical air—certainly worth a try. Magnolia liliiflora ‘Nigra,’ black lily magnolia, Zones 5-8. ‘Nigra’ is an improved cultivar over the species that forms a large shrub or small tree to 8-12’ high and equal width. The large flowers open wide like a lily and are dark purple on the outside and pale on the inside and are very showy against the leaves. This makes a nice specimen tree, hedge, or as a feature in a mixed border. Magnolia X loebneri, Loebner magnolia, Zones 5-9. 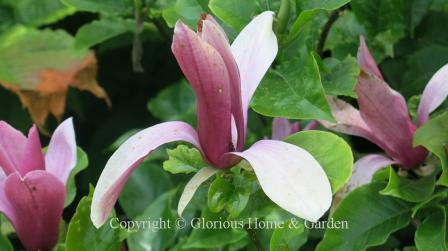 This deciduous magnolia is a cross between M. kobus and M. stellata. 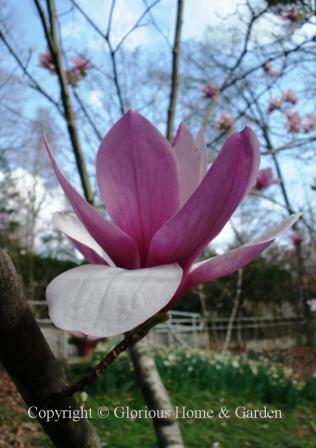 'Leonard Messel,' pictured, has the strappy petals of star magnolia--pale pink on the inside and darker on the reverse. 'Spring Snow' is a white variety. Magnolia macrophylla, bigleaf magnolia, Zones 5-8. This flowering tree is well-named--it has a big leaf, indeed! But so are the flowers huge! I was very impressed with this one I saw at the Daniel Stowe Botanical Gardens. It has a rather tropical air, and definitely needs lots of room if you are curious to try it. Magnolia sieboldii, Oyama magnolia, Zones 6-8. This Asian species can be grown as a large spring flowering tree to about 25,’ or a small shrub of about 10-15.’ The most distinguishing feature is the cluster of dark burgundy stamens in the center of each white flower. ‘Colossus,’ below, has larger flowers and leaves than the species, increased vigor, and is said to be more heat tolerant. 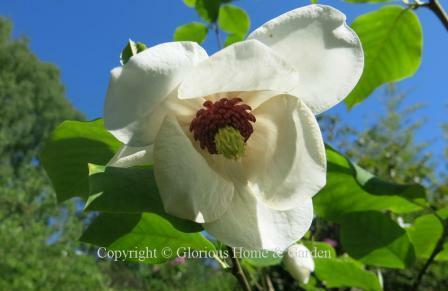 opening a little later than star magnolias, the large cup and saucer-shaped blooms are among the most beautiful of all flowering trees. Some years they will bloom early and be caught by a late freeze and the flowers will turn brown. But in a good year, they are glorious indeed! 'Alexandrina' is shown below. Magnolia stellata, star magnolia, Zones 4-9. 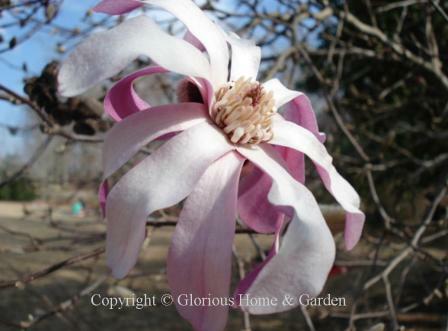 Star magnolias are charmers in pure white or pink. Their long ribbon-like petals flutter in the breeze. A full-grown specimen in full bloom is a breath-taking sight. 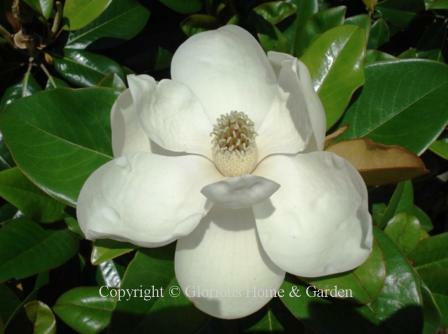 M. stellata is a smallish species of deciduous magnolia (eventually 15-20'), so it is well-suited for small gardens. 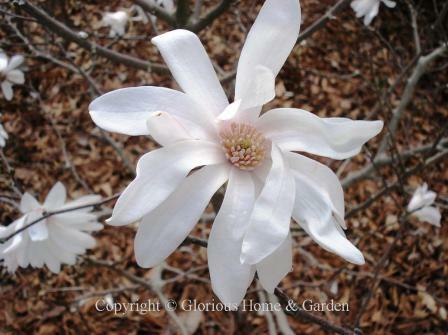 Star magnolia is often in full bloom during a warm spell in mid-February in the South. Under plant it with small early bulbs like crocuses, Iris reticulata, grape hyacinths or Anemone blanda. 'Star Dust,' shown, also has variegated foliage. Other beautiful cultivars include ‘Chrysanthemumiflora’ with deeper pink flowers, 'Royal Star’ white, ‘Scented Silver’ white with lovely fragrance, and ‘Waterlily’ pink opening to white and also fragrant. 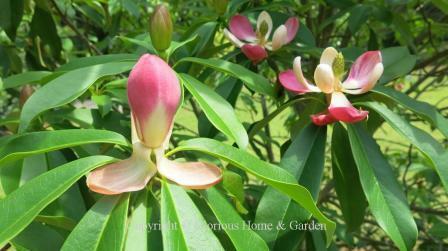 native evergreen magnolia, sweetbay is more cold hardy than M. grandiflora, but has a smaller stature overall--smaller size (to about 20'), smaller leaves and flowers--but that makes it a good choice for the smaller garden. 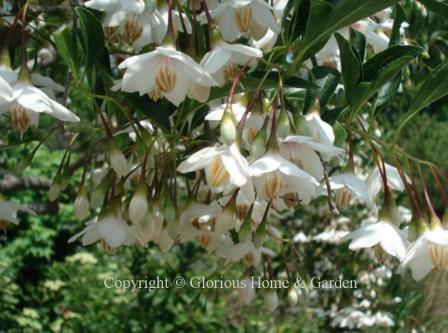 'Moonglow' (also known as 'Jim Wilson') has creamy flowers and an upright growth habit to 15-35'. Malus, crabapples, Zones 4-7. These flowering trees are star performers in the spring landscape. Few trees rival them for density of bloom, and they have the added bonus of beautiful, colorful fruit in the fall that attracts birds. Their drawback, however, is that they are susceptible to a number of diseases and pests, such as cankers, fireblight, cedar-apple rust, scale, borers, aphids and Japanese beetles to name a few. Fortunately, varieties have been developed that are resistant to some of these problems. Some of the most resistant include M. sargentii. with red buds that open to white; 'Adirondack' also with red buds opening to white; 'Dolgo' white; 'Indian Summer,' rose red; and 'Prairifire' with red buds opening to pink. 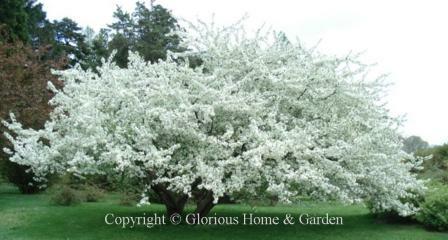 Malus sargentii, Sargent crabapple, Zones 4-7. 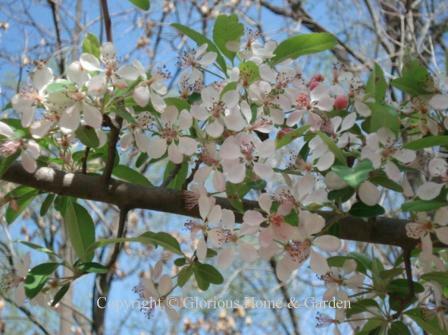 Sargent crabapple has red buds that open to white clouds in April. This magnificent one is at Winterthur. Prunus cerasifera, purpleleaf plum, Zones 5-8. One of the earliest trees to bloom in spring, purpleleaf plums produce clouds of pale pink flowers that seem to go by very quickly followed by dark purple leaves. Be careful when locating this ornamental, however, because the early flowers attract early bees so it's not a good choice near a children's play area --or near a driveway where the fruit can make a mess. 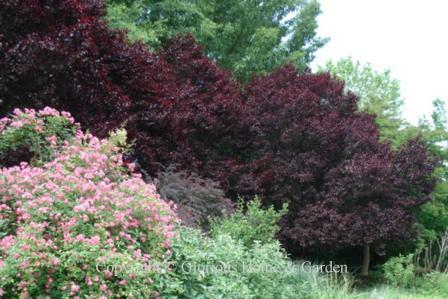 Cultivars include 'Atropurpurea,' 'Newport,' and 'Thundercloud' (shown below). 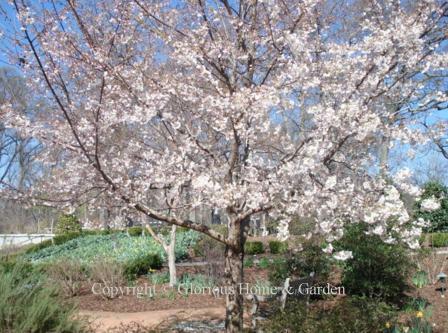 Prunus sargentii, Sargent cherry, Zones 4-7. Sargent cherry single pink flowers and handsome shiny reddish bark. A beautiful flowering tree, but best for the North as it does not do well in the heat of the South. 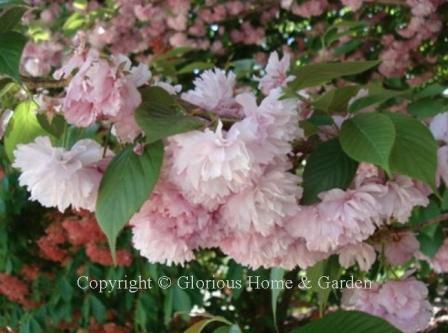 Prunus serrulata, Japanese flowering cherry, Zones 5-7. This beautiful spring flowering tree extends the cherry season by blooming after the Yoshinos. The fluffy powder-puff pink blooms of 'Kwanzan' (shown below) is the most familiar, but there are others like 'Snowgoose' pure white, and 'Shirotae' semi-double white. Prunus subhirtella, Higan cherry, Zones 5-8. P. subhirtella var. 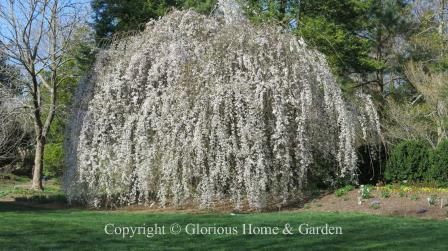 pendula is a gorgeous weeping flowering cherry that is a true knockout in the spring garden in shades of pink. The gorgeous one below is at the Lewis Ginter Botanical Garden in Richmond, VA.
P. subhirtella var. autumnalis has the curious habit of popping open some if its pale pink flowers in the autumn, sporadically throughout the winter, and then fully in the spring. gorgeous of the flowering trees and one I look forward to every year. This is the cherry tree that comes to mind for most people when they think of cherry trees. The majority of the cherries that rim the Tidal Basin in Washington, D.C. are this type. The white flowers cover the trees before the leaves emerge and fade to pale pink covering the ground like pink snow when they fall. 'Akebono' is shown below. Pyrus pyrifolia, Chinese sand pear, Zones 5-8. This is the species that produces the Asian pears you have seen in the supermarket. 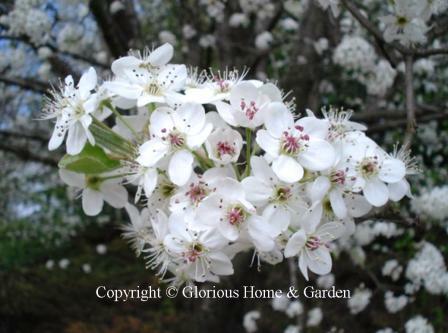 It also makes a beautiful ornamental tree when its white blooms cover the plant in spring. Check out named cultivars if you wish to grow it for fruit. 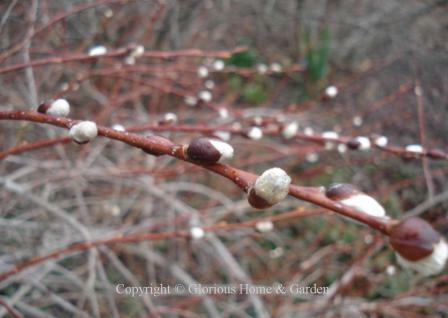 silvery catkins emerge in late winter to early spring on a graceful weeping small tree. Great as an eye-catching specimen for a small space. Styrax japonicus 'Rubra Pendula,' Japanese snowbell, Zones 5-8. The flowers of this small tree are best appreciated up close where the dangling white bell-shaped blooms can be admired.